Hello everyone! It's been AGES since I've done a book review and I've decided to do more soon, so yay xD Okay let's get into this.. I designed this myself, I hope you like it! Overall, this book was solid. Everything was really nice, I thought the plot flowed, and it most of the time made sense. It fell into very few stereotypes, and the love story was different. The plot was simple, Lara Jean writes letters to her crushes and keeps them. People find them, she has to face the conflict. I could actually handle the love triangle, which is so rare for me. It wasn't stupid, and honestly I could't tell who she was going to end up with. 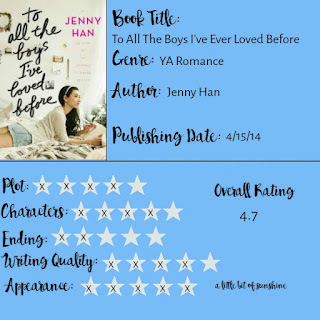 Like the synopsis says, I like how the letters help Lara Jean learn something and because of those letters, she really finds her true self, and embraces several things about her. Like I said, the plot overall made sense, and I thought the conflict of the book was quite interesting. The idea of the letters is very unique, and what Han did with the story also made it cool. 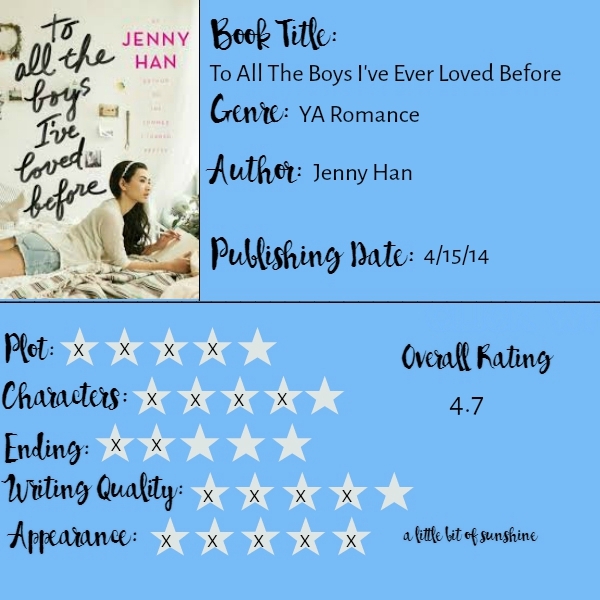 I really liked Jenny Han's writing style. The character dialogue was hilarious and made me laugh out loud MULTIPLE times. Han was also very creative with this, like I talked about. I would have never thought of some of the things she came up with throughout the story. Did I mention character development? I would recommend this book to people who like a little romance and humor. And if you can tolerate a decent love triangle. If you have no tolerance for love triangles and little stereotypes, you MAY want to steer clear of this book. I hope you guys enjoyed this little review! Let me know if you want more reviews or possibly some spoiler book talks of certain books, I'd be happy to splurge my feelings. Ooh, now I really want to read this!!! You should, it's such an amazing book! So I'm not really into romance, but the concept of this book sounds really interesting. Plus, it sounds like the characters were hilarious and had a lot banter going on. I might give it a try if I spy it in the library. Hey Noor, this Sophia. I left a comment on your last post, but you never replied. I had a question about your book club thing post. I want to enter, but I have a question. Is it okay for me to read the same book as someone else? Oops lol did the link wrong sorry it didnt work. Yes of course, why would that be a problem xD Sorry about the late reply, I didn't see the comment! I got this out of the library after reading this review, it is SO good! I just finished! I know, the cliffhanger is so annoying! I t was a really great book! I've heard a lot of good things about this book, but I'm not sure if it's for me.. I will definitely try it out, though! This sounds like a pretty good book and this is a really good review Noor! Thank you Rukiya! I don't know, it might surprise you, it's really amazing :D And thanks, I worked really hard on it! Great review! To All Boys I've Ever Loved Before was meh, for me. Me and Lara Jean just didn't work out. I'm glad you liked this book tho! Thanks for sharing this great book review, Noor. Great post! I might just read this book! ;) I also tagged you, though I bet you've already done this! Thanks for commenting on Out of Coffee, Out of Mind! When I saw the title I was unsure but it actually sounds like a really good book, I am intrigued to find out what happens to her after she mails the letters!